It's not made clear from the beginning just how to unlock the Dark Zone in The Division 2, but it's actually not that tricky. It's the only place - other than Skirmish - to fight other players in a PvP environment, and it's also where you'll get some of the best loot available in the game. 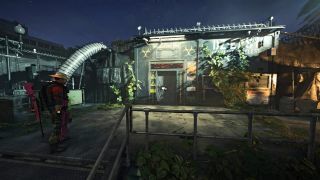 You need to progress quite a way through The Division 2 before you can access the Dark Zone though, so if you're wondering how to unlock the Dark Zone in The Division 2, read on. So you’ve jumped into The Division 2 headfirst and you can’t wait to test your mettle against other players. Just go to the Dark Zone! Unfortunately, it’s not quite that simple. You first need to ensure you’ve unlocked the Theater settlement in Downtown East - this is the first settlement you unlock, still during the initial stages of the game. When you’ve completed that and met with Odessa Sawyer multiple times, you’ll be able to complete the various projects available at the Theater. You can’t gain access to the Dark Zone until you’ve recruited the right person; Senait Ezera. She’s the third person you can recruit back to the Base of Operations from the Theater, so you’re going to need to upgrade the Theater three times. This is done by completing the available projects, which require donations and activities to be completed. When you recruit Inaya al-Khaliq and Grace Larson, you’ll be able to unlock Senait Ezera. She took a while to show up for us so if she should be available but isn’t, leave and complete a mission or two then return; you should find her on ground level, at the end of the alley past the loading docks. Talk to her and she’ll enable the Dark Zone East Recon mission. From here, it’s as simple as going to the mission location and doing everything she tells you. It’s essentially a brief tutorial to the Dark Zone and isn’t particularly difficult, so you’ll fly through it. After that, you’ll be able to go and complete the Recon missions for Dark Zone South and Dark Zone West. Get ready though, because the Dark Zone isn’t for the faint hearted!